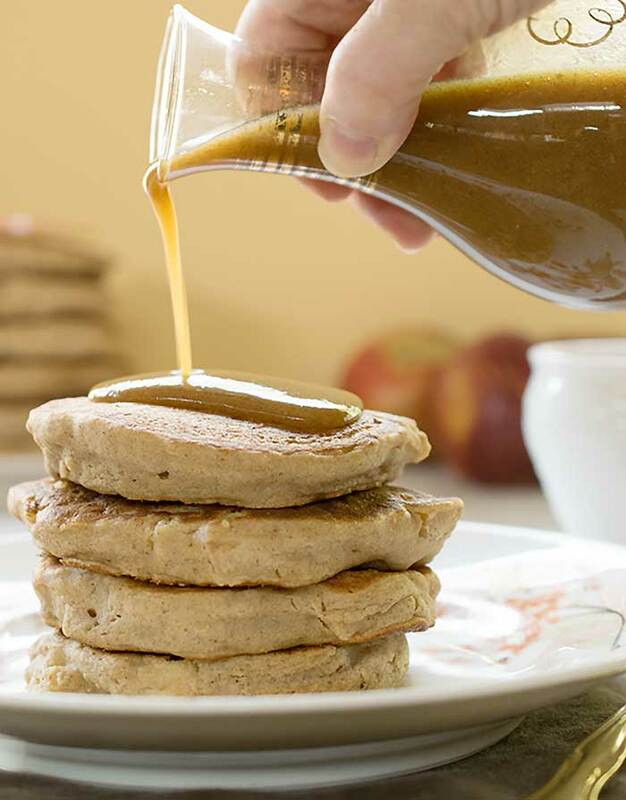 These gluten-free apple teff pancakes with homemade date caramel syrup are a great way to baby yourself, celebrate fall, and feed yourself a refined-sugar-free treat. I don’t know about you, but this autumn I need to get back into a healthy routine. Breakfast is a great place to start treating yourself well. 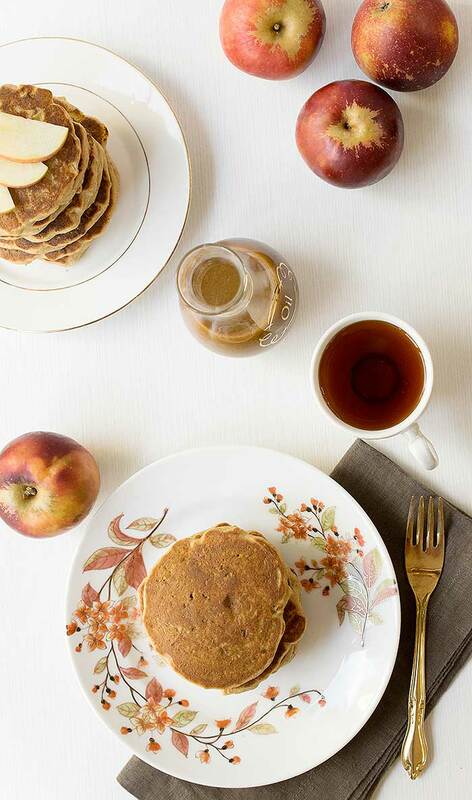 These apple teff pancakes will have you jumping out of bed. They are full of whole grain fiber and fresh chopped apples. Add a drizzle of vegan caramel sauce and it tastes like you’re having dessert for breakfast. But much, much healthier. What if you could have a caramel apple for breakfast? 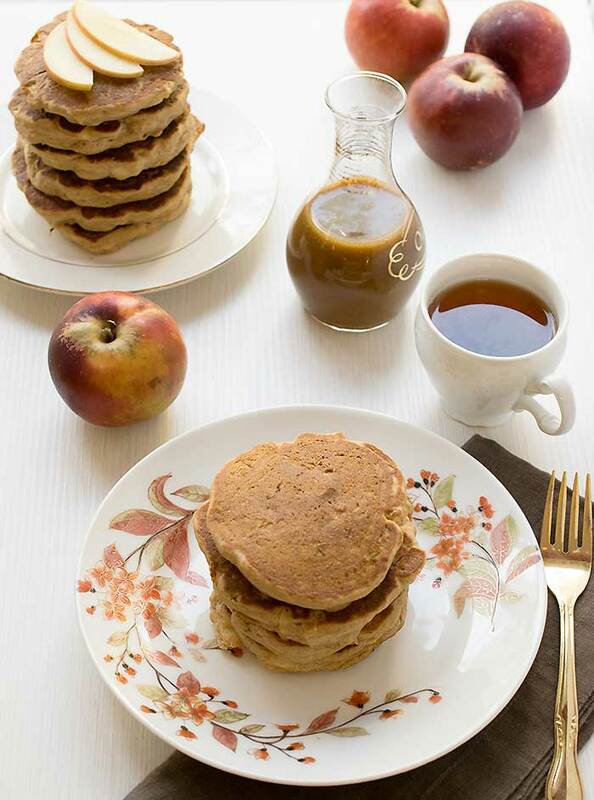 These teff pancakes are my healthier version that you really can start your day with. 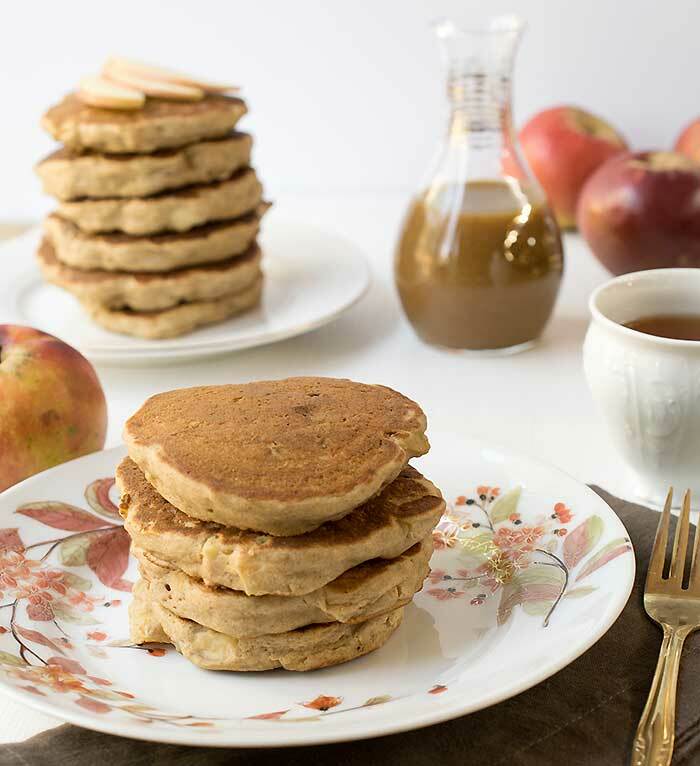 The pancakes are full of whole grains and can be made with no added oil. They are sweetened with fresh apples and a little of the date caramel syrup. Try them in the morning before you head out to the fair or go on a long autumn walk. Make the Date Caramel SyrupAdd the dates and water into a small saucepan and bring to a boil. Then turn the heat to low and simmer for 5 minutes. Carefully pour into your blender with the vanilla and blend until smooth. Add extra water, ¼ cup at a time, to thin the syrup if it’s too thick. Make the PancakesAdd the nondairy milk, flax mixture, oil (if using), sweetener of choice, vanilla to a mixing bowl and mix well. Then stir in the minced apple. Mix the Maskal Ivory Teff Flour, baking powder, cinnamon, and salt in a separate medium-sized mixing bowl. Heat a nonstick skillet over medium heat. Add the wet mixture to the dry and mix well. The batter mixture will be thick, but you can thin it by stirring in some extra water a tablespoon at a time as you need it. Scoop a heaping ¼ cup of batter and spread in a thick circle and cook until the bottom edges start to look dry. Flip and cook on the other side until it browns. Repeat until all the batter is cooked. Serve topped with Date Caramel Syrup or maple syrup if you prefer. Your pancakes look delicious! 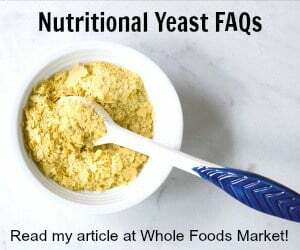 Do you think the same recipe would work with white whole wheat flour? I don’t have any Teff flour. I do think regular flour could be substituted. I do that in many recipes. I want to tell you that I LOOOOVE these pancakes and make them often! Simple to make, come together quickly and so yummy. My toddler also approves 🙂 This is our weekend breakfast staple and leftovers freeze and refrigerate beautifully for a quick on the go breakfast during the week. Thanks so much! !